In 1904 the British touring side travelled to Australia and New Zealand, two of the squad were from New Zealand, the team manager A.B. O’Brien of Guy’s Hospital, and P.F. McEvedy also of Guy’s. What seems to have been lost in time is that they were both London Irish players. Doctor Arthur Boniface O'Brien, MRCS LRCP 1905, MB BS Lon 1905, MD Lon 1906, FRCS 1912, FRACS 1920, was born in New Zealand in 1878 and studied at St. Patrick’s College, Wellington. He moved to England to Study Medicine and first played for London Irish in 1900. In December 1900 he was in the Irish side who played Racing Club de France in Paris which finished in a 25 points to 5 victory for the visitors. In August 1901 whilst studying at Guy’s Authur won the Michael Harris Prize open scholarship being awarded £10. He also took part in the Exiles first Irish tour to Dublin in 1901 and he most of enjoyed it and he returned again to play on their second tour. He obtained the gold medal and exhibition in Organic Chemistry, and also the gold medal and and exhibition in Anatomy in 1902. Arthur was a regular for the Kent county side taking part in a number of County Championship matches, and also took part in a number of England trial matches, but was never selected. In 1904 he represented Ulster in the Provincial championship and was picked as a reserve for Ireland. Selected to play for the 1904 British touring side, he was elected manager and was rather successful, with the Lions only winning 17 out of 19 matches. On 1st August 1906, he married Miss Mary Catherine Carter at St. Mary Magdalen Church in Brockley. In 1907 Doctor O’Brien returned to Christchurch, New Zealand and worked as a MD. In 1929 he was elected as a Fellow of the Australasian College of Surgeons. He died in Christchurch in 1951 aged 73 years. Doctor Patrick “Pat” Francis McEvedy MB BS (Lond) 1906, MRCS (Eng) LRCP (Lond) 1906 was born in Southbridge, Canterbury in 1880. He was also educated at St. Patrick’s College and studied Medicine at Guy’s. Whilst at Guy’s he won the Arthur Durham and Hilton prizes in anatomy; acted as an anatomy demonstrator for 1 year. He first played for London Irish in 1900 and last played in 1907, managing to play and captain Guy’s at the same time. He also took part in the match against Racing in 1900, and the tours to Ireland in 1900 and 1901. He was also a Kent county player and took part in seventy matches for the county. He took part in nine England trials but failed to be picked. 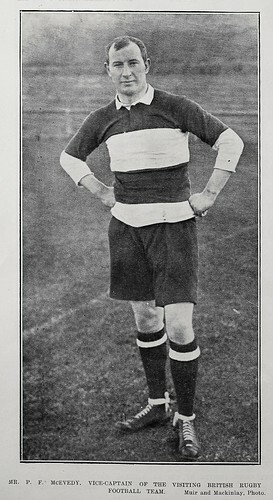 He travelled with the Lions in 1904 and as vice-captain in 1908. During the 1908 tour he broke his arm and retired from active play (and only ever played one more game for the Wellesbury Club against the officers of H.M.S. New Zealand a few years later). In 1909 he returned to New Zealand and registered as a medical practitioner in NZ 8/2/1909, commencing practice in Wellington at 158 Willis Street. The following year he became a member of the Wellington Rugby Union. In 1912-14 he was Honorary Physician, Wellington Hospital 1912 – 1914. From 1917 to 1929 he was elected vice-president of the Wellington Rugby Union, then becoming President. In 1934 he became Chairman of the New Zealand Rugby Union. Upon returning to New Zealand he took up playing cricket and ended up as the vice-president of both the Wellington Cricket Association and Wellington Cricket Club. He was also chairman of the New Zealand Boxing Council, Patron of the Combined St Pat’s Old Boys’ Athletic Association Club, chairman of directors of J. Staples and Co. Ltd, director of the New Zealand Breweries Ltd., a steward of the Wellington Racing Club, chairman of the Wellesley Club committee, a life member of the Heretaunga Golf Club, a member of the Hutt Valley Gun Club and medical officer of the Wellington City Council. Doctor McEvedy died in 1935 aged 55 years. He is still remembered in New Zealand in the form of the McEvedy Shield – The Wellington Secondary Schools Athletic Championship. A. O'Brien and P. McEvedy, the two New Zealand three-quarters, are probably better known here than any of the rest of the team. They are both brilliant players, and have done sterling work for Guy's Hospital, Kent County, Ulster F.C., and the London Irish F.C. It was with a view of qualifying for the Irish International against England that these two players went over to Ireland and qualified in the Ulster Club as Irish players. But they were not picked for the same reason as that which excluded them from the English International team-viz., they were New Zealanders. In this respect both the English and Irish Selection Committees were determined only to play men born and educated in England and Ireland. O'Brien and McEvedy were picked as reserves for All England. The two New Zealanders-Mr. A.B. O’Brien and Mr. P.F. McEvedy-who have played a great game at three-quarters for Kent County this season (writes the London Correspondent of the ‘Evening Star’) have accepted the invitation of the Irish Rugby Union to play in the interprovincial matches at Dublin, with the probable chance of selection to appear for Ireland against England at Blackheath next month. Commenting on this fact, the football scribe of the ‘Morning Post’ says: ‘The more that is seen of these men the greater grows the mystery why the English Selection Committee ignored them. McEvedy and O’Brien are colonial-born, but having developed their football in English circles they thought it proper at first to try and secure their English caps’. Thanks Tony. They are not on the honours board, nor are around twenty others who have represented the club. They are both mentioned in numerous newspaper articles I have come across. I am still looking for the players lost in WW1. Can only echo Tony's comment ... nice bit of research Paul. Excellent, I suggest you contact Kieran McCarthy or Paddy Lennon to have the honours board corrected for our new home at Hazlewood corrected and these long past servants of the club recognised.